Toronto (January 30, 2019) - Friends of Simon Wiesenthal Center (FSWC) is calling on universities across Canada to disallow the distribution of newly released Israeli Apartheid Week marketing material that is promoting terrorism against the state of Israel. 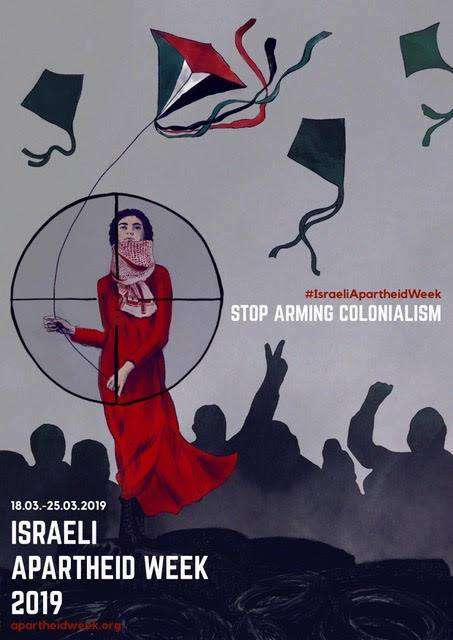 A poster that reads “Stop Arming Colonialism” and promotes Israeli Apartheid Week includes a drawing of a Palestinian girl waving a Palestinian kite – representing the Palestinian protests that have taken place and attack kites that have been used to initiate fires and destroy Israeli land. Since spring 2018, hundreds of incendiary kites and balloons have been launched into Israel from Gaza, destroying more than 2,600 hectares of agricultural land and forests. According to the Israel Ministry of Foreign Affairs, 76 innocent people have been killed and 1187 wounded in Palestinian terrorist attacks – including stabbing, shooting, ramming and pipe bomb attacks – since October 2015.